If you haven’t started thinking about it already, our 20th Reunion is coming up: June 7-9, 2013. This would be a great time to update your information and let us know what you’re up to. You can email me or just log on to the Brandeis alumni website. We welcomed our third child, Adena, in September, and she has her two big brothers wrapped around her little finger. She’s already been to a Brandeis basketball game and the Bernstein Festival of the Creative Arts, where we always run into fellow alumni. My boys can’t wait for the 20th Reunion, where they get to run around campus and hear stories about my life as a college student. If you haven’t been to campus in a while, it has really been transformed over the past 20 years and is a beautiful place to hang out on a spring day. Eric Parker is the communications director for U.S. Rep. Frederica Wilson (D-Fla.) and lives in Arlington, Va. Feeling green. 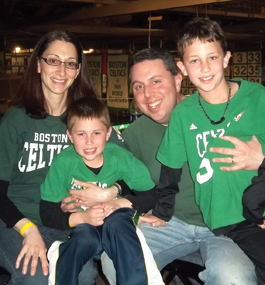 In March, Marc ’92 and Sharon Cohen ’93 and their children, Jordan and Adam, enjoyed the Celtics’ 88-76 victory over the Washington Wizards at TD Garden. More than 100 alumni, family and friends attended the event, which was co-chaired by Doug Rosner ’88, president of the Alumni Club of Greater Boston, and David Morris ’96.